Home / Other Political News, Politics / OSCAR SUDI threatens to reveal how MATIANGI and KIBICHO looted Sh 1.5 billion in Ruaraka land scandal – Is UHURU aware of this? OSCAR SUDI threatens to reveal how MATIANGI and KIBICHO looted Sh 1.5 billion in Ruaraka land scandal – Is UHURU aware of this? 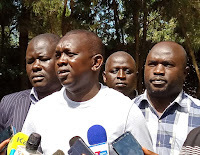 Monday April 15, 2019-Kapseret MP, Oscar Sudi has threatened to expose Interior Cordination Cabinet Secretary, Fred Matiangi and his Principal Secretary, Karanja Kibicho over how they were involved in the Ruaraka land scandal. In the Ruaraka land scandal, Kenya taxpayers lost Sh 1.5 billion and according to Sudi he will tell Kenyans how Matiangi and Kibicho looted the money. Sudi who was having a press briefing in Eldoret on Monday said Kibicho has been holding secret meetings to scheme against Deputy President William Ruto and finances those undermining the DP. “Soon we will spill all that we know and let them be aware that we know all that they have been doing in those meetings,Ruto will not be pushed out of Jubilee by his detractors who want to take over control of the party, “he said. Kibicho is a close ally of former Jubilee Party Vice chairman, David Murathe, who resigned in January after claiming that Mt Kenya region will not support Ruto’s presidential bid in 2022.
the head of the snake is aware of this looting and that's why he had delegated looters to head his mirage dreams that are not valid. His appointment are a collection of looters and state assassins to diplomatic level are the appointment. it's a sorry regime founded on mungiki memorandum (by the assassination of Prof Saitoti and his deputy and Ngaiseri) and looting without shame under the foolishness of borrowing debts to loot.